There are only a select few of this style in the entire building and when they come on the market, it is a lucky day for the buyer who acts quickly! We love the flexibility of this floor plan and of the options it has for a perfect two bed open loft concept. There is a wonderful bedroom as you first walk in the door that offers privacy and tranquility. There is a terrific opportunity to add stairs and access the mezzanine space for an additional sleeping area or living space. And then there is an extraordinary bonus alcove space near the windows that we have seen other residents use for an in-home office, second bedroom, dining area or entertainment room. It’s a great extra space to have and truly makes the home one of a kind! 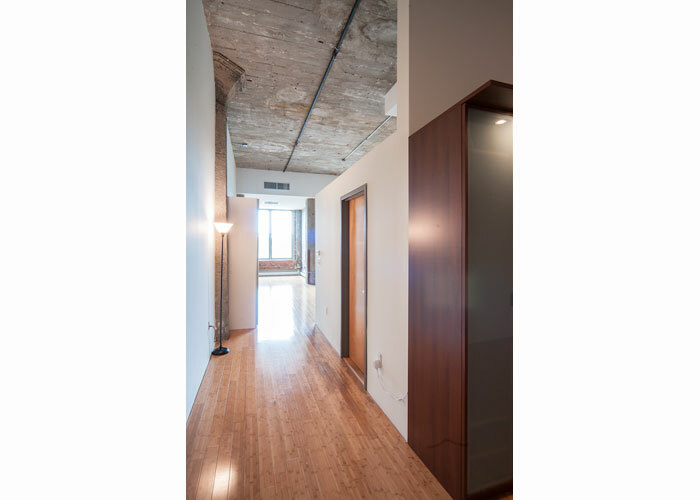 Of course all the other must have loft features are here too, including a stunning stainless steel kitchen, soaring 14 foot ceilings, exposed brick, blasted concrete and wall to wall warehouse windows that allow amazing natural light to fill the space. A modern bathroom, in-loft laundry and parking complete the package. Park views, enormous roof deck, roof top entertainment room and on-site management are outstanding in this pristine elevator building in East Boston’s best location. The convenience is exceptional just steps to the T, Tunnels and the superior parks and bike paths. We continue to be amazed at all the marvelous new specialty shops and eateries and with the Waterfront prime for development again, get ready for the East Boston real estate boom! It’s coming quickly and trust us – you’ll want to be part of it!